We had our Halloween parties over the weekend. Mr. Fantastic and I are obsessed with The Big Bang Theory and while we are closer to Sheldon and Penny, I really can't pull off any blonde costumes. 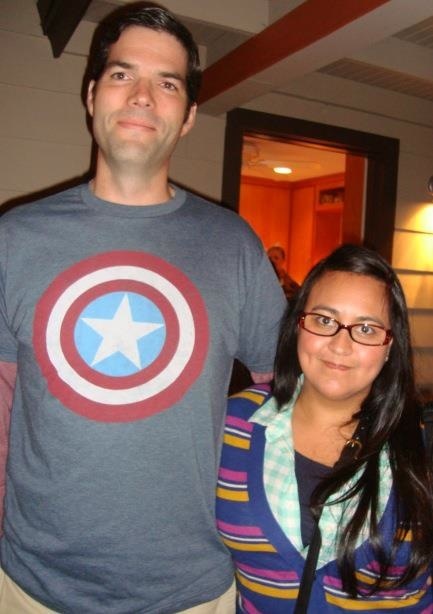 So instead, we dressed as Sheldon Cooper and Amy Farrah Fowler. Today will be all about the kids. They are having their friends over and I am making them chicken salad sandwiches, mashed potatoes, and a plethora of cake, cupcakes, chips and punch before they head out trick-or-treating. We LOVE Halloween. Mr. 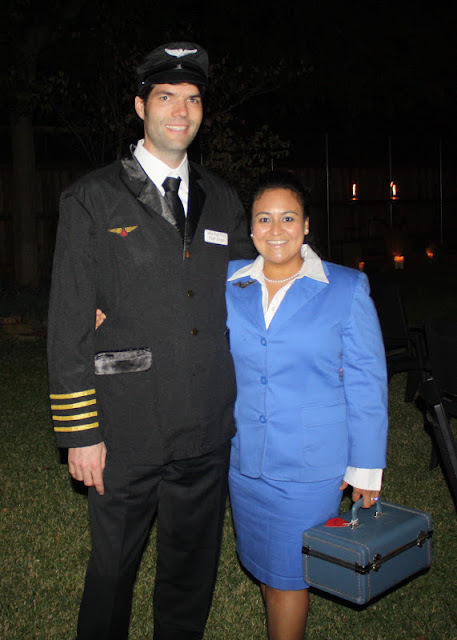 Fantastic and I find couples costumes that we both agree on and then the kids always get to be whoever they want. Here are some of the costumes we've had in the past. This was one of the most EPIC fails in the history of Halloween costumes. 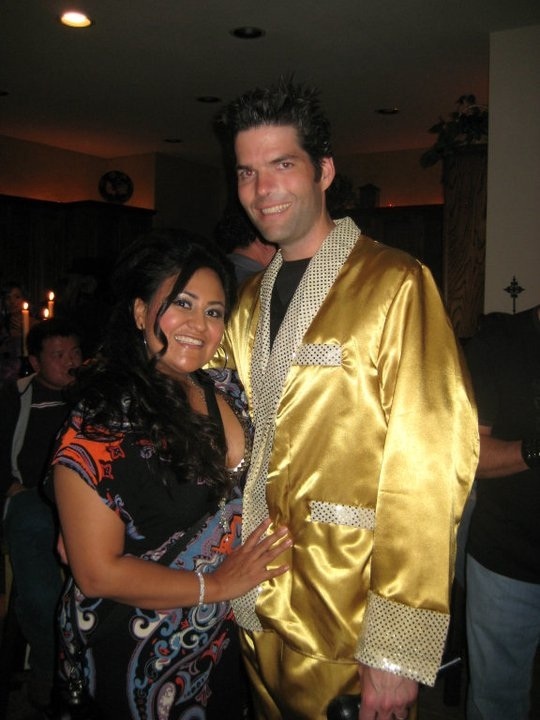 We were invited to Party Like Rock Stars for The Musicman's birthday a couple of years ago and we chose Elvis and Priscilla. I put my hair up in a buffant and wore a little babydoll dress with fishnet stockings and really high platform heels and we used a wax pomade to put Mr. Fantastic's hair into a pompadour, but his hair wasn't long enough and the wax stiffened almost immediately. The end result? Everyone thought we were Snooki and Pauly D. :( The entire night, everyone thought that I dressed as Snooki on purpose! 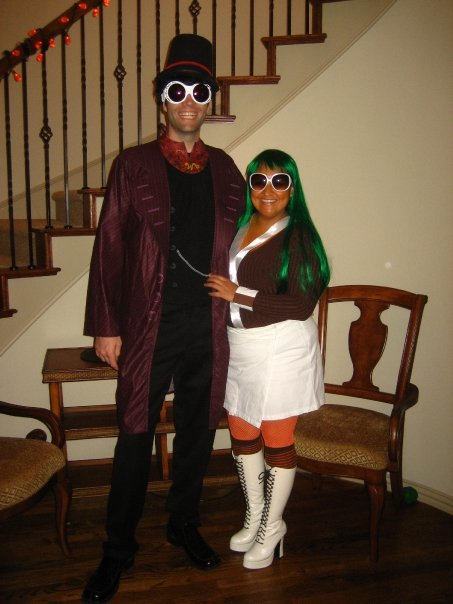 Our favorite is still Willy Wonka and an Oompa Loompa. Mr. Fantastic even had a little flute to call me over and I put eyelash glue over my eyebrows and rubbed a cotton ball across my eyebrows to make them white. I printed out a few golden tickets and painted my skin orange-y. This one might have to make a comeback, because I LOVED it! Do you dress up for Halloween? What are your favorite costumes? Any good suggestions for couples costumes for next year? I love big bang theory! 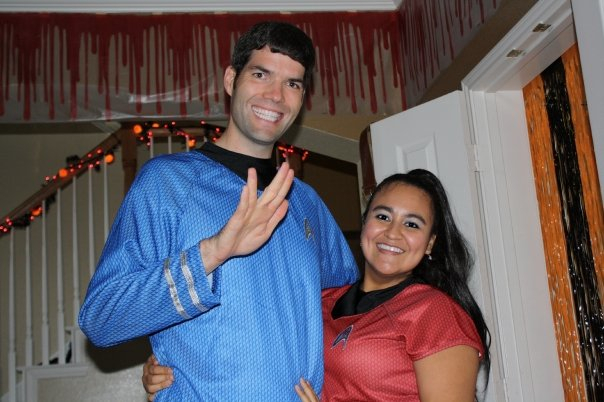 Love that you guys dressed as Sheldon and Amy and love seeing the recaps on costumes. So great.